I hope you've had time today to enjoy this wonderful summer-like weather. I absolutely love it! I have the day off from work today, and I spent the better part of my morning getting all summer weather ready. I had my hair done (super blonde!) and went to Chinatown to pick up some of my warm weather wardrobe essentials (more about that next week on the 11th apartment). And now, finally, I'm back at the blog! It's been a bit of a strange month, and over the past two weeks I haven't been posting on the 11th as often as I like to. When our fridge stopped working a few weeks ago, our landlord delivered a new one, and in the process scratched, dented and chipped our entire front hall and staircase. Long story short, I spent the holiday weekend fixing and repainting not only the walls and staircase hand rail, but the floor itself (as if the painted tile floor wasn't enough work when I first took the project on last spring)! There's not much satisfaction to be had in re-doing a job. The first time it was so inspiring to see that horrible orange and brown 70's tile become a sleek and dark blue-grey floor in our entry way, the second time (this past Victoria Day weekend) I painted myself out of the house, washed my hands at the nearby McDonalds, and wished that I could have spent the day working on new projects for the blog. Well, here we are a week later and I do have some great new things to share! 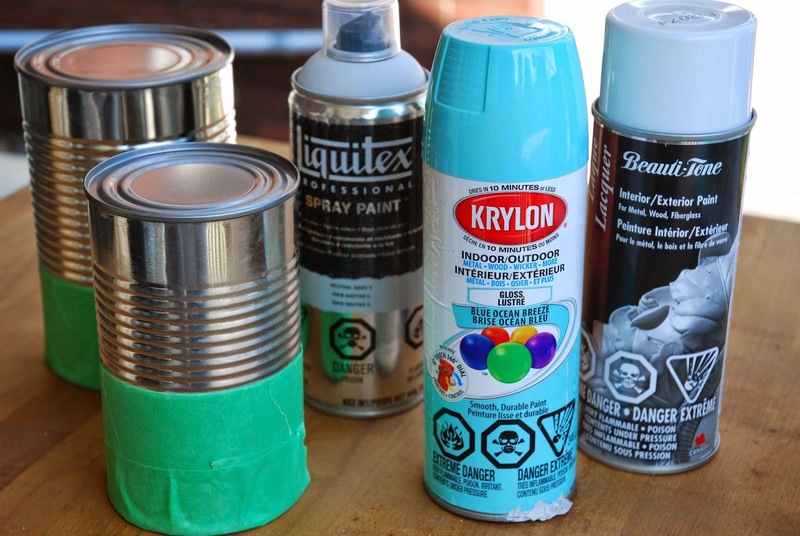 Starting today I've got a whole week of simple and small DIY projects. It's craft week! (Monday-Friday). 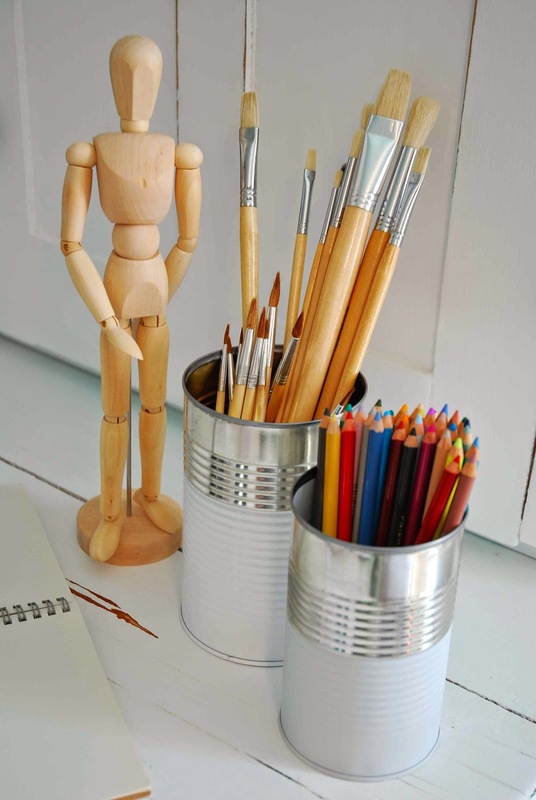 Many of these projects can be completed in under an hour. They're sort of like crafts for adults! And today's project is based on the dip painting trend that I mentioned earlier this month in my post on refinishing wood without stripping. 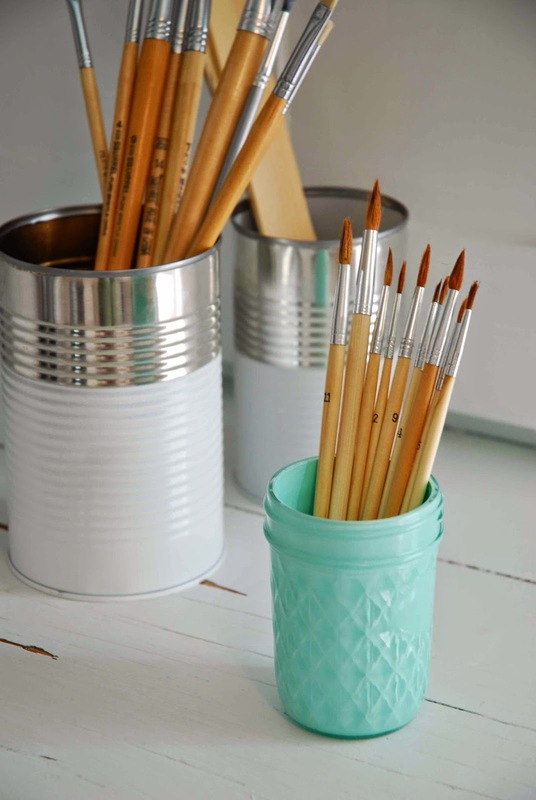 These dip painted containers are inexpensive, easy to make and extremely versatile! 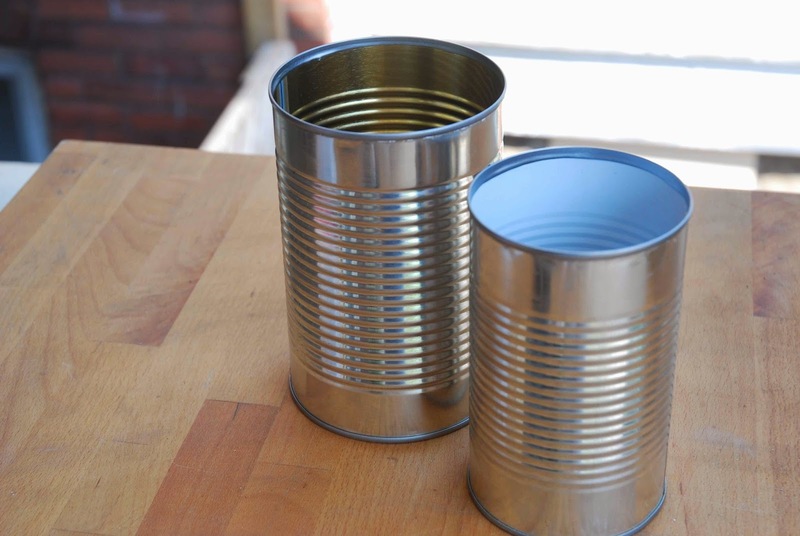 I painted two cans, the larger one is an Allen's apple juice can and the smaller is a large tomato sauce can. The hardest part of this project is definitely removing the glue left by the labels. I used steel wool soaked in Goo-Gone, a paper towel and varsol and some hot soapy water. It was a bit of a process to say the least! 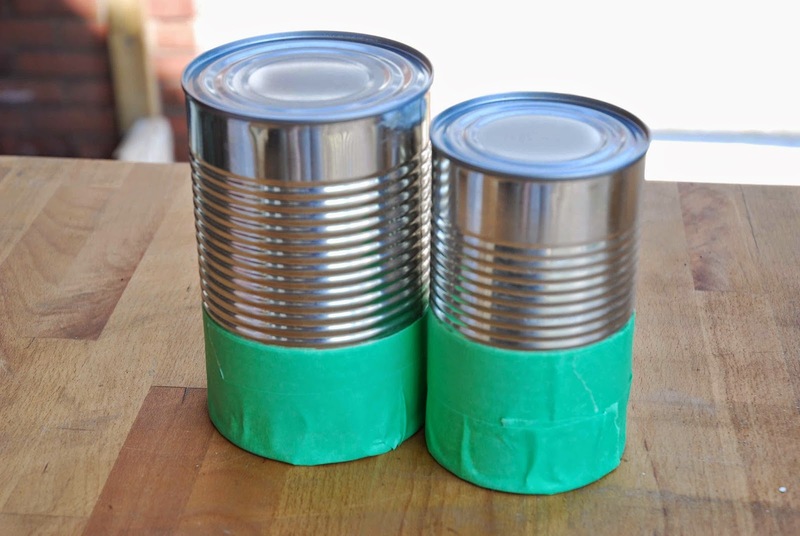 I taped off the top third of the clean cans using painter's tape. Then I simply applied multiple light coats of spray paint and later removed the tape. The cans turned out really well. 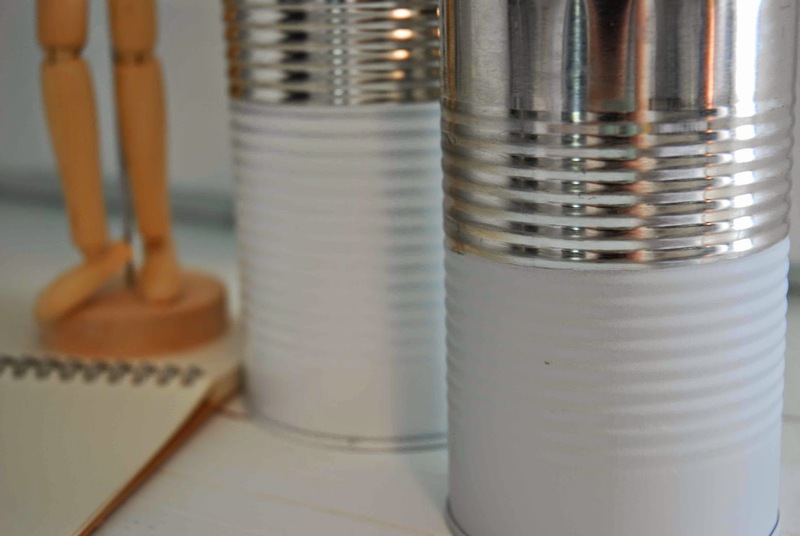 I used a white and a light grey spray paint and I think the containers have a modern, simple and classic look. I'll be using these containers for my art supplies, but they'd also look great in the kitchen and could hold anything from wooden spoons to chopsticks to cutlery. Here's a variation on this craft, take a cute glass container (I used a vintage mason jar) and apply a few coats of paint to the inside. Volia! 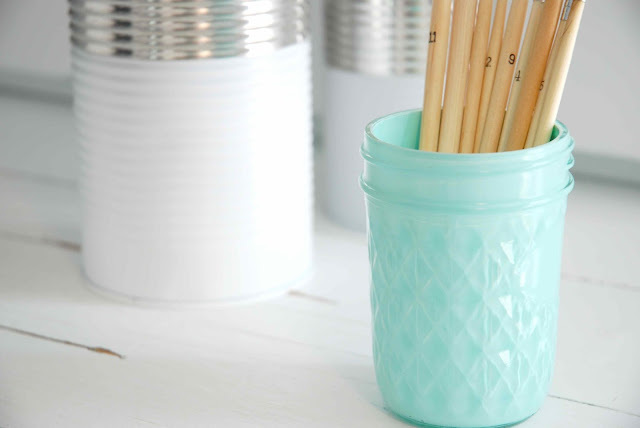 A pretty and practical pencil jar. 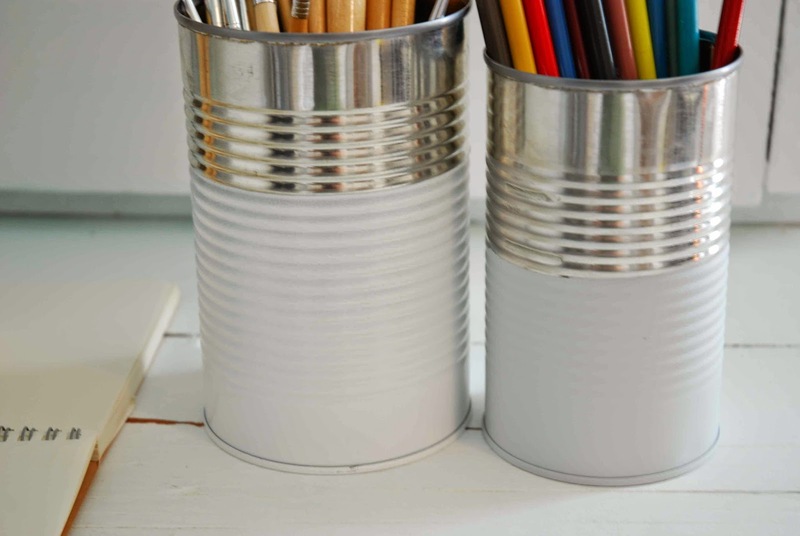 Come back to the 11th apartment tomorrow to check out Tuesday's easy craft project. And keep up with the 11th anytime by following the 11th apartment on pinterest and instagram!